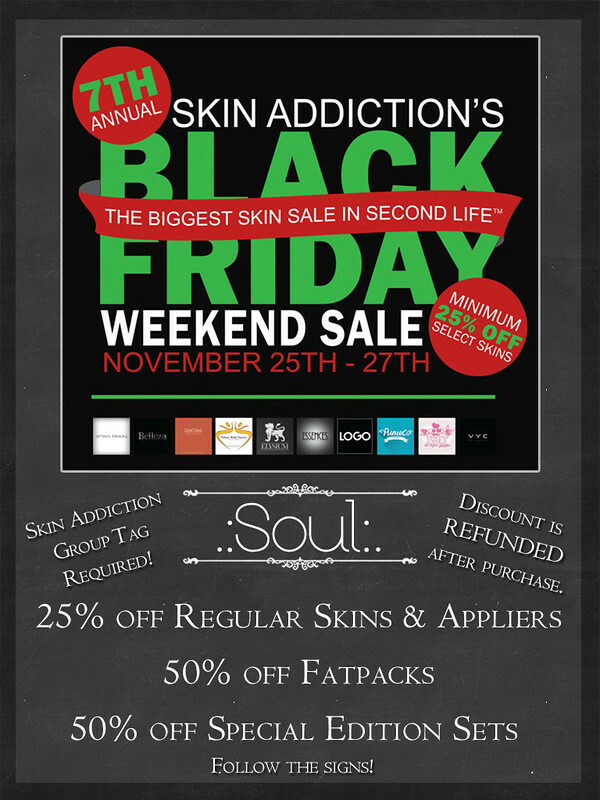 Black Friday Sales @ .:Soul:. | .:Soul:. Black Friday Sales @ .:Soul:. ~ Discount is REFUNDED after purchase. ~ ONLY for Skin Addiction Members and ONLY in the Glade, up the stairs, to the right of the landing point! .:Soul:. V.I.P.s group will also be FREE ADMISSION through the 27th! * Keep an eye on the VIP Notices for Flash Sales throughout the 25th! This entry was posted in Events, Sales! and tagged Appliers, Black Friday, Sale, skins, VIP Group. Bookmark the permalink.